> Any live cell with fewer than two live neighbors dies, as if by underpopulation. > Any live cell with two or three live neighbors lives on to the next generation. > Any live cell with more than three live neighbors dies, as if by overpopulation. > Any dead cell with exactly three live neighbors becomes a live cell, as if by reproduction. The Game of Life in Helius' is realized in a finite two-dimensional space. If a cell reaches the edge of the field, then its neighbors also are the cells on the opposite side of the screen. The size of the two-dimensional field depends on screen ratio of the iOS device, on different versions of the iPhone and iPad it is different. 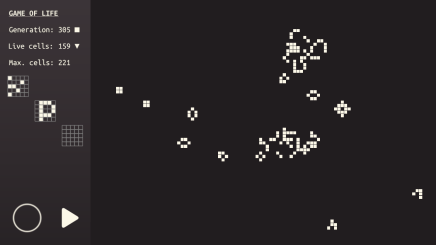 The goal of the game is to create a cell population that can run on the screen as long as possible, until it degenerates into primitive static or cyclic forms. How many living cells can you create? Can you create a population that will live indefinitely in time? Send us your viable seed of cells as start point for long lived population!